After sketching the problem of creating User Control Libraries in VS 2010 and various ways to solve it (some of them no longer supported or cumbersome to use), here is a solution that works in VS2010. 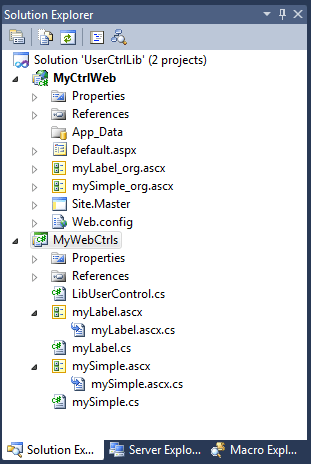 We start with a web application project containing a couple of ascx controls, and migrate them into a library. Sample code is available for download. This entry was posted on Friday, February 11th, 2011 at 9:31 and is filed under .Net, ASP.Net, C#, Visual Studio. You can follow any responses to this entry through the RSS 2.0 feed. You can leave a response, or trackback from your own site. This was very helpful. I was able to get it working for my project except for I am also recursively loading my usercontrol by calling LoadControl. When I remove the recursive load everything is good, however, I need the recursive load. It is building a treeview of sorts. This of course no longer works since the .ascx is embedded. Any ideas on how to get around this? Thanks! So simple I’m embarrassed. I built the recursive control some time ago and for some reason went down the path of LoadControl. Had my blinders on yesterday and I didn’t even think to try something so simple. I found two improvements in my experience, which you might confirm. *First, let’s say you have two UC’s you want to apply this too, and the second UC is embedded in the markup of the first. When Page.ParseControl(content); gets hit for the embedded UC, the Page object will be null, therefore we should be overriding OnInit instead of FrameworkInitialize. 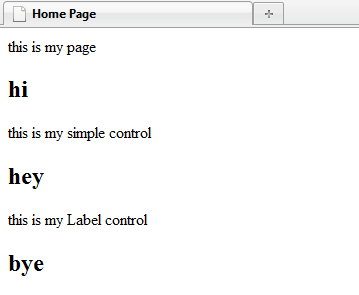 Wish there was a way to automate this without knowing exactly which controls on the page have Content Templates on them!! jesus christ… adding an usercontrol from a dll OUGHT TO be simple. I’ve been trying this since yesterday untill i found this. Amazing the amount of docs for vs 2005 and almost none ( that works without reinventing the wheel or without nuclear science behind it) to vs 2010.
uhoh, and what about if i want to have an button in my user control, where do i put de CS code ? ( i have a dropdowlist and a button as search ). Thanks for this article. It’s the best on this topic I could find. I’ve been searching for a way to add the UserControls created with this method to the Toolbox, but have found nothing. If I add a proper WebControl to the same control library then it will show in the Toolbox, but the User controls don’t show. Do you (or anyone else reading) have a solution? For wiring the events of controls, you can also add “onserverclick=’MyControl_MyEvent'” to the markup.